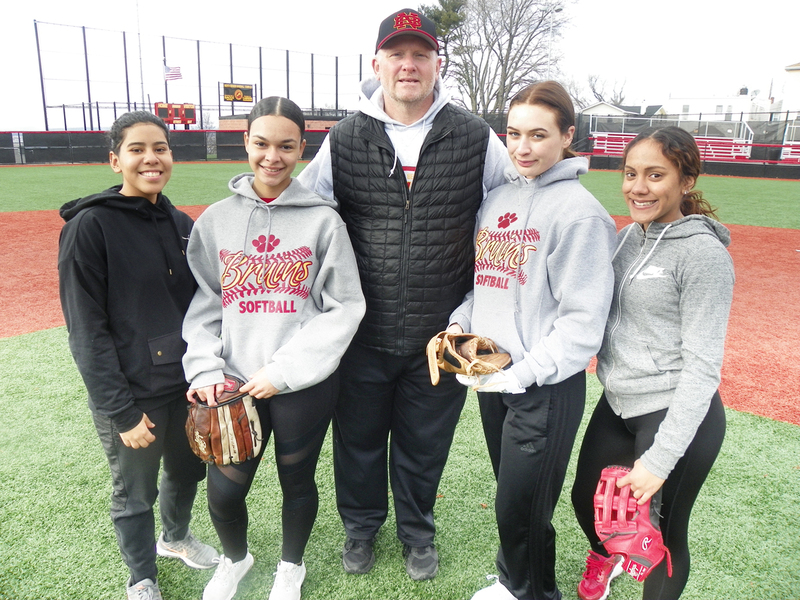 The North Bergen softball team won the Hudson County Tournament last year, marking the second straight county title for head coach Shawn Stacevicz (center). With Stacevicz from left are seniors Evelyn Morel, Keyri Felix, Nichole Deacutis and Natalie DeSoto. If Shawn Stacevicz is going to make it three straight Hudson County Softball Tournament championships as a head coach this spring, he will have to do it with an almost entirely different North Bergen roster than the one the 2018 Hudson Reporter Coach of the Year won with a year ago. Stacevicz, who won the 2017 county title with Hudson Catholic, then moved to North Bergen a year ago and won the county crown there in unprecedented fashion, lost a boat load of talented players to the pomp and circumstance of graduation last June. The Bruins lost four members of the Hudson Reporter All-Area team, namely pitcher Lauren Cabrera, first baseman Angelique Rivera, outfielder Cassandra Fernandez and 2018 Hudson Reporter Most Valuable Player Arianna Diaz, the Bruins’ shortstop, to graduation. Only senior outfielder Keyri Felix returns from last year’s All-Area squad. That’s a tough road to hoe if you are Stacevicz, looking to be holding the county championship trophy for a third straight year. Needless to say, Stacevicz is counting on Felix, who batted .454 last year. Freshman Amanda Pace, fresh off her great stint as a wrestler in the winter, is one of the forerunners to become the Bruins’ pitcher this spring. Sophomore Siarah Saavedra, who saw limited time last year with the varsity, and junior Jaden Foley, who was with the junior varsity last year, are pitchers who will get a chance to throw for the Bruins this spring. The catcher is junior Amarillys Santiago, who returns from last year’s county champion. First base duties are being shared by senior Nichole Deacutis and sophomore Suemia Filian. Deacutis did not play at all last year and Filian was on the JV but was with the varsity by season’s end. Senior Natalie DeSoto is the second baseman, while junior Kailyn Troya is the shortstop, stepping into the spot that Diaz owned. The third baseman is junior Jada Flores, another graduate of the Bruins’ JV program. Freshman Nicole Franklin and senior Evelyn Morel are sharing duties in left field, with Felix moving from left field to center and junior Stephanie Valderrama sharing right field with sophomore Nathalie Mera. Stacevicz thinks that Union City might be the team to beat, but for now, the Bruins remain the defending champs and the coach has the title of being a two-time defending county champ. It’s up to the rest of the county to topple the Bruins from their pedestal.